I could write a list of everything I bring on my trips but I guarantee that we do not pack the same. I may pack more tank tops where you prefer dresses or I listed packing items for Thailand and you are preparing for Mongolia in the winter (p.s. I'm jealous). Instead, I have composed a list of the 10 to consider while packing and prepping for any upcoming trip. As a general rule of thumb, I try to lay everything out a week before I leave. This gives me the opportunity to repack which will hopefully lessen the amount I bring. How many tank tops do I really need? Also as it turns out they do laundry all over the world and there are some nice ladies and gents waiting for you at the laundry mat to wash your clothes. So no need to over pack! Wear and wash and wear again. 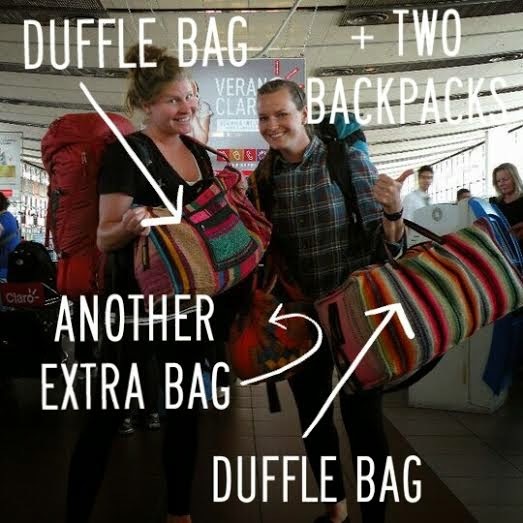 If your style of travel is "backpacking" then your best luggage option is a backpack (I know, huge surprise). "Backpacking" did not get it's name from no where. It is easier to carry your luggage on both shoulders while walking blocks and blocks to your hostel or to the bus station. However, we will both agree that after a few weeks backpacks are so annoying because everything you need always seems to be at the bottom, but not anymore! Packing cubes are your answer. Personal Experience: I have used two different top loading backpacks for my trips, Arc'teryx Bora 40L and Osprey Aether 60L. I wanted to travel light in South America so I found a second hand Arc'teryx Bora. It was the perfect size until I bought something. By the end of the trip I had an extra duffel bag anyways. I am a strong believer in packing light but once on the road I can't pass up a good souvenir (hello, Peruvian llama sweaters). I just have to come to terms with the fact that whatever backpack I bring I will always be lugging around an extra duffel bag, luckily they are pretty. If your backpacking trip includes anywhere humid it will most likely include tropical rain storms. I would suggest an umbrella instead of a raincoat. I can't tell you how many times I have zipped up my raincoat to find out later that I am soaking wet on the inside, as if I'd been wearing just a t-shirt in the downpour. Raincoats do not breath. I am still trying to remember to bring an umbrella when I pack. If you are the type of person whose souvenirs consist of shirts with Singha Beer logos then leave a tank top or two at home. I seriously have enough shirts from traveling to outfit a whole football team (#gohawks). Lets all hope this doesn't happen but what if you are walking along the sidewalk and a motorcycle whizzes by and grabs your day bag from your shoulder. Wallet, passport, camera. Gone to some thieves and their buddies! It is easier to prepare for this while home then once it has already happened abroad. Bring an extra debit card and be able to access your bank account online. Hopefully, before all your money is stolen you can transfer it all to your backup debit card (side note: it is always good to tell your bank you are traveling so they know a withdrawal at an ATM is not fraud). Have extra passport photos and a photocopy of your passport. Supposedly this makes it easier for the consulate abroad to reissue a (emergency) passport. Finally, be prepared financially because a little extra money is always needed while traveling. They sell cameras all over the world and although it is a complete devastation that you photos are lost forever new ones can still be taken with your new camera. I have been stuck fleeing to the U.S. Consulate while abroad for last minute extra visa passport pages so to avoid this unwelcomed life lesson count your passport pages before leaving. 99% of the time you will need two additional blank visa passport pages per country. Your passport also needs to be valid for an additional six months. I find it ideal to backpack countries where you receive a tourist visa on arrival but not all places offer this luxury. Months prior to leaving make sure to check the visa requirements before arriving at the airport for a trip to India, China or Brazil, to name a few (Americans, I am looking at you). Are you going to a country that requires a yellow fever vaccination (Kenya and Bolivia to name a few)? We don't want you to get pricked at the border in a third world country so have proof of your vaccinations from your home country. In general, before leaving you should schedule an appointment with a travel doctor to cover your bases.